Labour’s grueling general election defeat did not occur because the party is too leftwing, but rather because its rhetoric on austerity was misguided and failed to offer real alternatives, a leading trade union chief said. In a Guardianarticle, published on Wednesday, Unite General Secretary Len McCluskey suggested fallen Labour leader Ed Miliband had proven a disappointment. McCluskey, one of Labour’s most generous donors, argued the party’s narratives on creating wealth became a smokescreen for abandoning society’s most vulnerable. He also expressed concern over the path the party may take, as it strives to move forward after last Thursday’s excruciating blow. The Unite chief’s words will prove influential as they are likely to mirror the views of a wide contingent of Britain’s trade union movement. Unite could influence the election race for Labour’s next leader. Observers suggest its political heavyweights and MP affiliates will likely prove persuasive. Writing in the Guardian, McCluskey isolated Labour’s vow to reduce the deficit by 2020 as particularly problematic. Such an economic path would inevitably require deep spending cuts, which experts warn will crush society’s most vulnerable. He argued Labour had fallen for the Conservative Party’s austerity delusion long before polling day last Thursday. Krugman, who teaches economics at Princeton University, said Britain only returned to growth midway through the government’s term in power after it caved on its agenda of repairing the nation’s finances in a five year stint. He argued the Tories are doomed to repeat the same mistakes if they enter government for a second term, while Labour’s failure to oppose austerity is perplexing. The US economist said an overarching “deficit obsession” rules in Britain even as it fades elsewhere. He said this “intellectually bankrupt” devotion to austerity has become a “distinctly British delusion” and will inevitably lead to further economic struggle. “So Labour was left trying to protect the victims of the Tory cuts agenda while accepting its underlying premises, also depriving itself of a coherent narrative linking together popular individual policies,” he said. McCluskey hinted Labour had lost touch with its founding ideals. He said the party’s general election campaign lacked a “central theme” and failed to engage Britain’s working class and middle class voters, many of whom demand a fairer society. The trade union chief lashed out at adherents to Tony Blair’s New Labour approach for suggesting Labour’s defeat resulted from the party’s left-leaning tendencies. 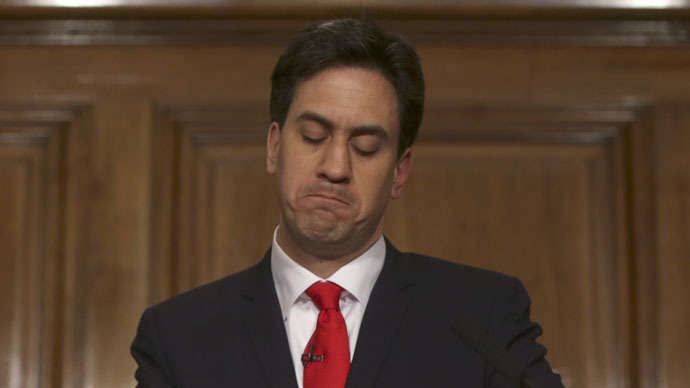 Rather, he argued New Labour’s map for wealth creation collapsed when the 2008 financial crisis hit Britain. “Leave it to the market, let the City rip – these were guiding principles of New Labour’s economic policy and, whatever their merits in 1997, they are simply not credible today,” he said. The trade union chief said Labour’s loss was predictable, and ultimately many of Britain's leftist voters gravitated to the Greens and the Scottish Nationalist Party (SNP). “Even more voted for UKIP and in many cases they too were expressing hostility to elite economics,” he added. Miliband’s leadership success in 2010 was driven by his firm belief that UK politics had shifted drastically since Britain’s financial crisis. Some observers say his inability to carry through on this theory by eclipsing David Cameron as Prime Minister is a political tragedy for Britain.